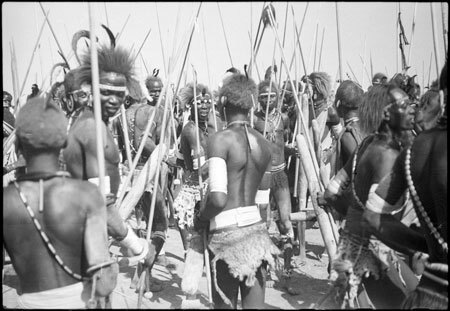 A group of Dinka youths at a funeral dance near Malakal, carrying numerous spears and ambatch parrying shields, and wearing numerous dance ornaments and accessories. Morton, Chris. "Dinka dance" Southern Sudan Project (in development). 03 Jan. 2006. Pitt Rivers Museum. <http://southernsudan.prm.ox.ac.uk/details/2004.130.36620.1/>.